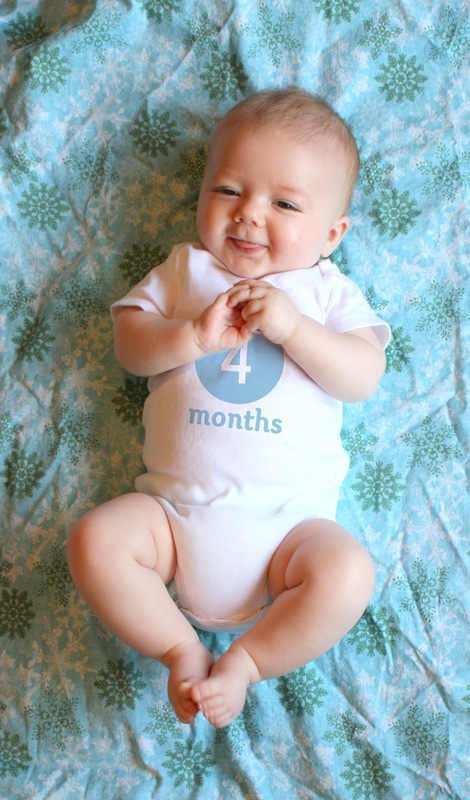 James is four months old and happy as can be! Well he is happy when I am holding him and his brother is not "patting" him. He weighs 14 lbs and is 25.5 inches long. That makes him in the 36% for weight and 74% for height. He caught wind of that 36% and has since been eating like I have been starving him. Every 3 hours. James laughs and beams at us all the time but the main change from 3 to 4 months, is that he has found his hands and he loves to put them in his mouth. He also kicks and waves his arms around in his bouncer. Especially when he is getting tired. It is like he ramps up before he crashes. He is still not sleeping through the night, but I know that will come. Actually, I secretly think I am never going to get a full night's sleep again. Two days ago James only got up at 11 then slept until 7...but his brother was up at 3 and 4. Such is the life of a mother to young children. This too shall pass (says my mom). He is too cute I can't stand it! !